After weeks of preparation, Frank was finally ready for an intensive period of maintenance and upgrades to PatiCat. He was a bit nervous since this was his first time to conduct a haulout for a large sailing vessel. 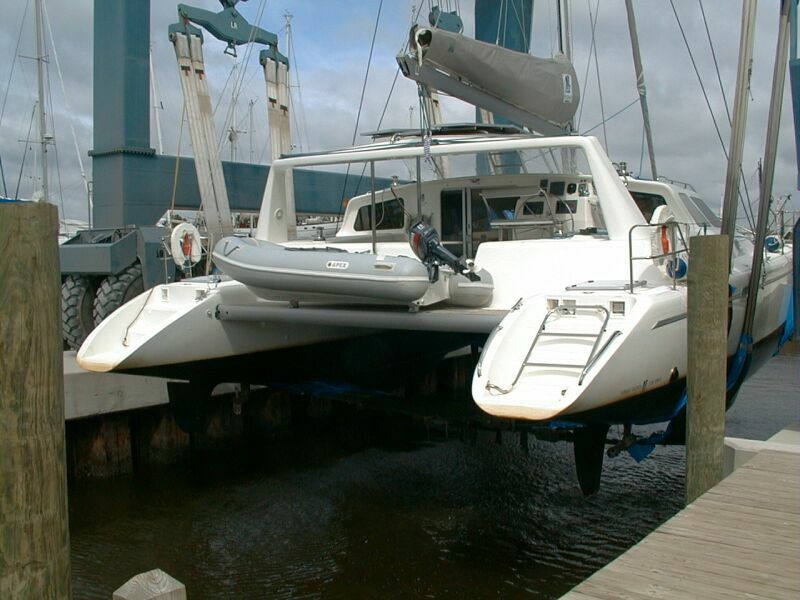 Time is money at a boatyard since you are charged a per day fee (called a "layday") while your boat is sitting in the boatyard hard on the ground. Frank had to coordinate the purchase of equipment for the upgrades and maintenance, tools, and supplies. Then he needed to coordinate the hiring of contractors to assist with some of the upgrades which were beyond his experience or abilities/tools. Any of these items could have caused delays (i.e. more laydays) if they didn't arrive on time. 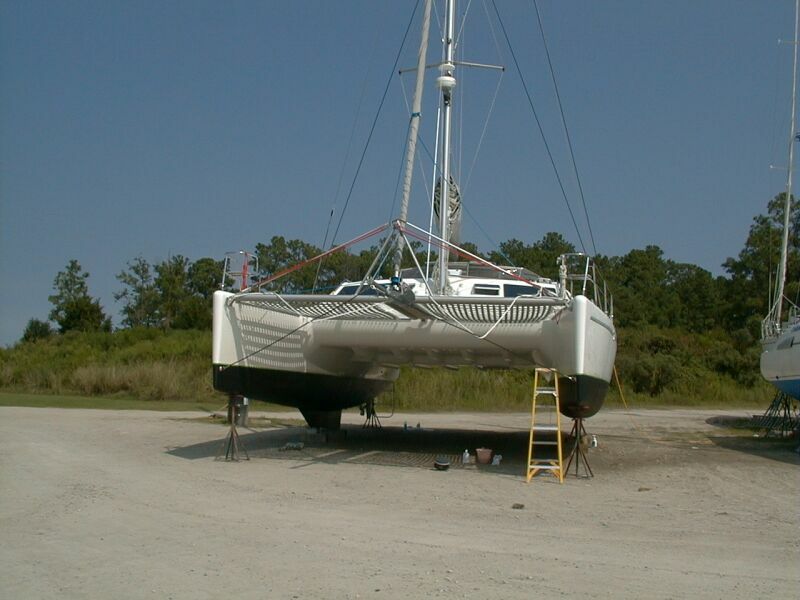 Maintenance tasks included cleaning off barnacles (if any), putting new anti-fouling paint on the bottom, engine maintenance, propellor maintenance, and waxing the underside and hulls of the boat to keep it clean. In addition, a host of new equipment installations including a new SSB radio, grounding system for the radio, a new antenna for the SSB, and new propellors for both engines. 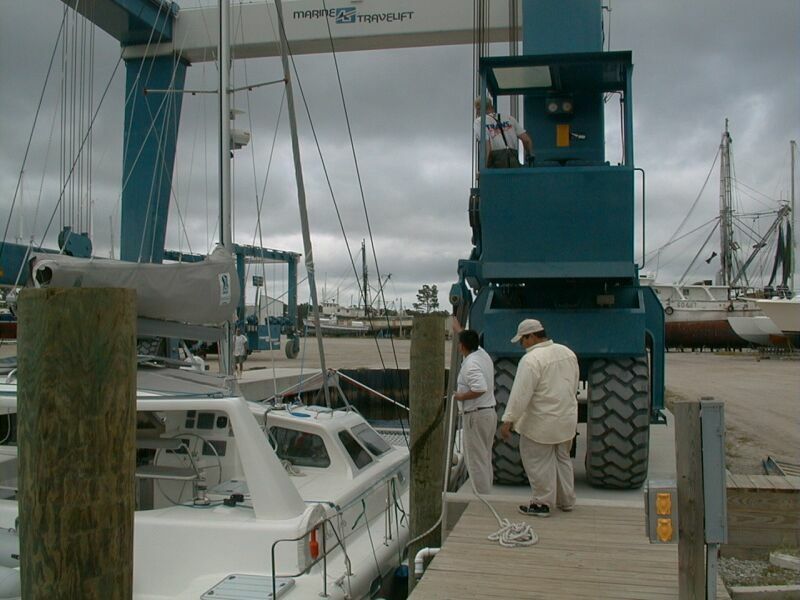 The Taylor family went down to New Bern for one more trip to the Sheraton Marina to move our boat out. Our friends from Paradise were there to see us off. We arrived mid-afternoon with a good breeze. A storm was building on the north east coast of Florida providing good winds. The storm was forecasted to build strength and move up the coast and possibly turn into a tropical depresssion. We emptied our holding tanks, said our goodbyes, and departed. Twenty minutes later saw us under the bridges and sailing at 8.5 knots down the Neuse. We had a great sail all the way to Adams Creek with winds increasing to 25 knots and a reef in both sails. We hit 9.5 knots by the time we were down there (and Paticat's bottom was not clean!). We laid anchor in Adams Creek, which was well shielded from the breeze and had a pleasant night. Early the next morning, the storm coming up the coast was officially named "Gustav" and was forecasted to possibly turn into a hurricane within 48 hours. 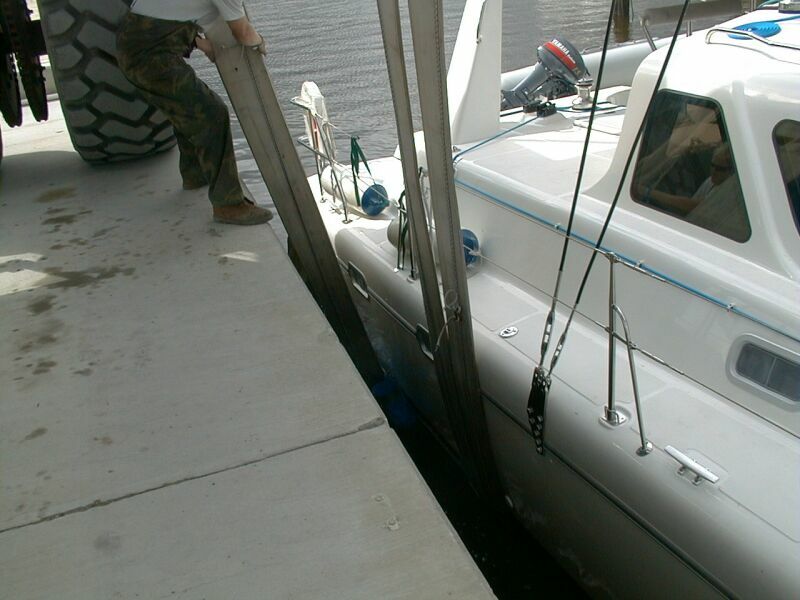 The best course of action for us was to get our boat hauled-out in relatively safe condition on the ground. 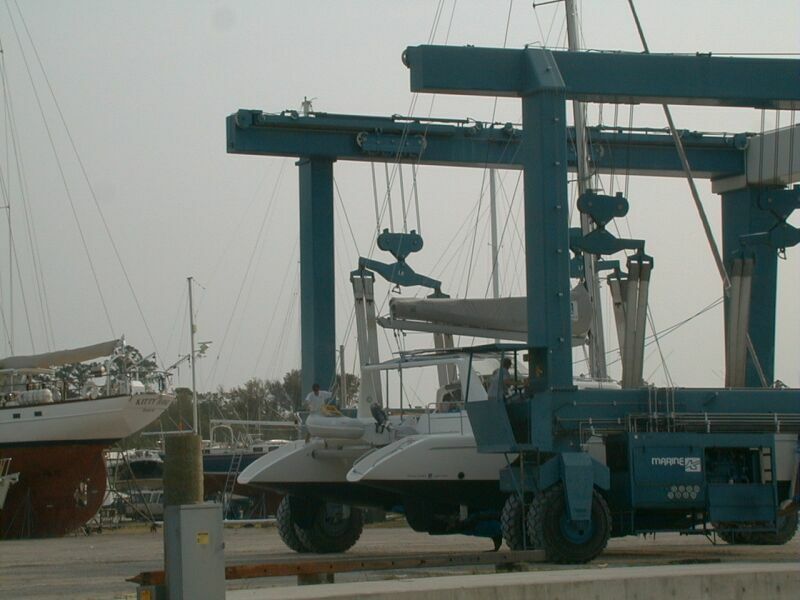 Ironically, it was a partly sunny morning as we motored down the Intracoastal Waterway down to Jarrett's Bay Boatworks (the boatyard). We were a bit concerned about a bridge we needed to get under since the waters were a bit higher than usual (due to already building storm surge). 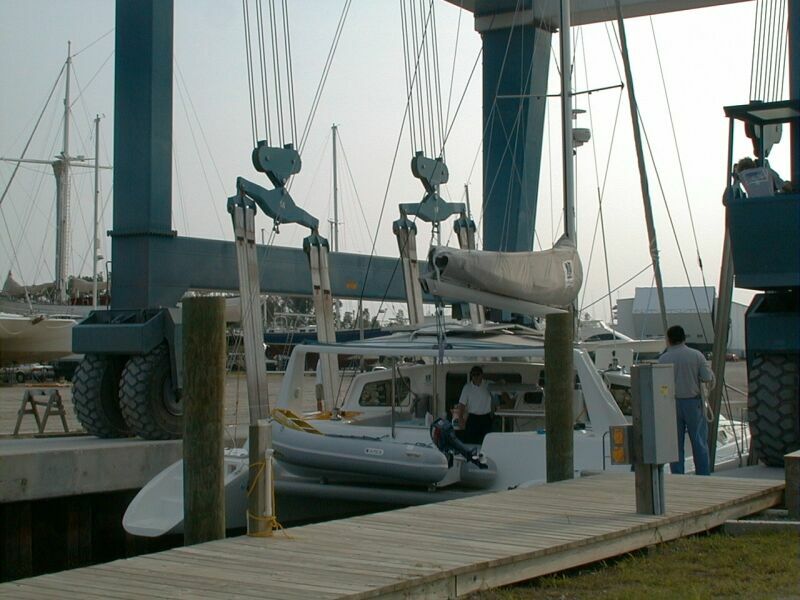 But, we had at least 3 feet of clearance between our mast and the bridge (our stereo radio whip is four feet above the mast and it - only - just touched the bridge - always a scary thing - whew! We call it our curb/bridge feeler). We arrived around 9:00 AM at our assigned time. But, they had a number of boats being hauled (some due to the anticipated storm). Frank sent Karen and the girls home (we had brought one of the cars down to Beaufort before we left New Bern the day before) as one of the girls had a doctors appointment back in Raleigh later in the day. 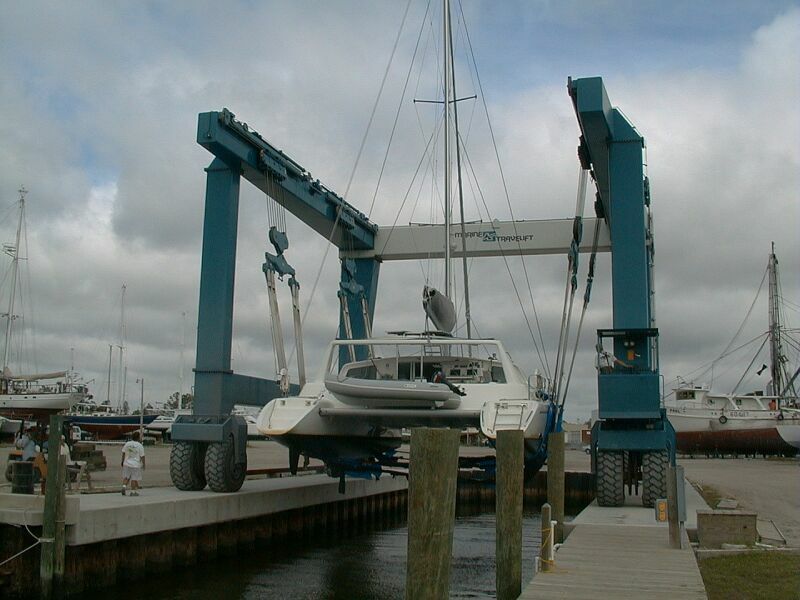 A few hours later, they finially hauled Paticat out of the water. Here are some pictures of the haulout. Note the clouds from the storm building. They had some difficulty making sure the lifting straps were not interfering with the keels, rudders, or the saildrives for the propellors. Note the brown stains at the waterline from the yucky water in the Neuse. They moved us to the end of a row of catamarans, and put us on some blocks and some stands. Without going into excessive details, we managed to accomplish nearly all of the objectives within the assigned week. 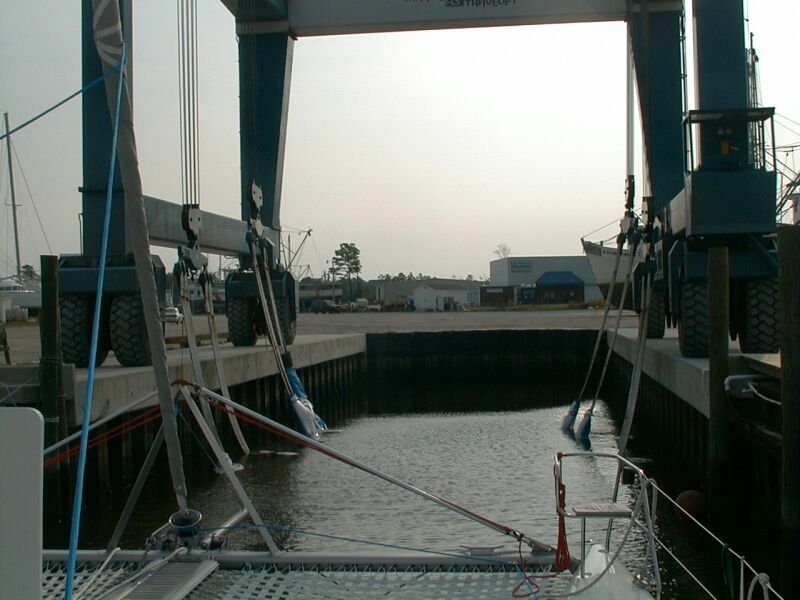 With good help from contractors, the boatyard, and my friends from New Bern on Paradise, we managed to do all of the aforementioned tasks (there were a few other ambitious items on the list, but they didn't require being out of the water). The more technically difficult job was the SSB radio. Thank goodness my friends from Paradise helped with this. We also had a rigger help with the antenna installation (this involves cutting one of our shrouds into three peices and installing insulators between the longest middle peice and then wiring it to the radio). Frank went up the mast twice to take down and put up the shroud. Unfortunately, Frank was too occupied with the operation to remember to take pictures! 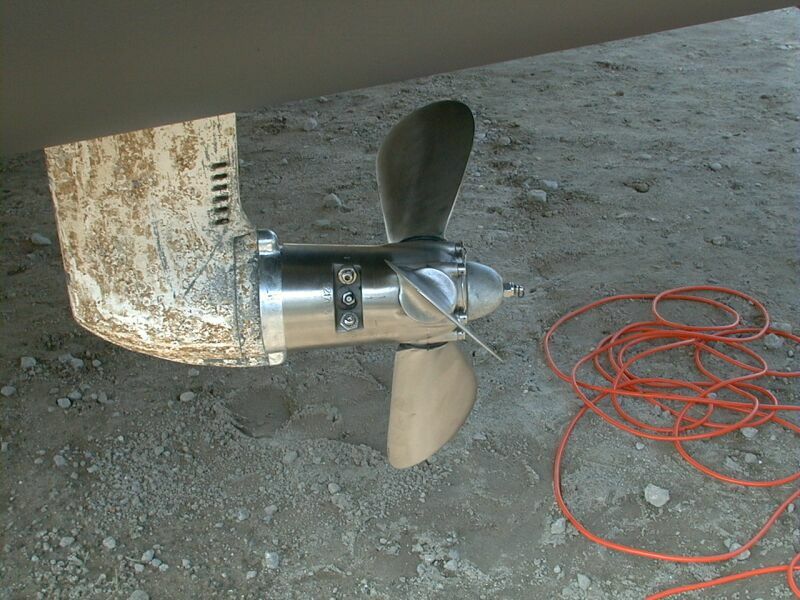 Another big project was the installation of the new Autostream feathering propellors. 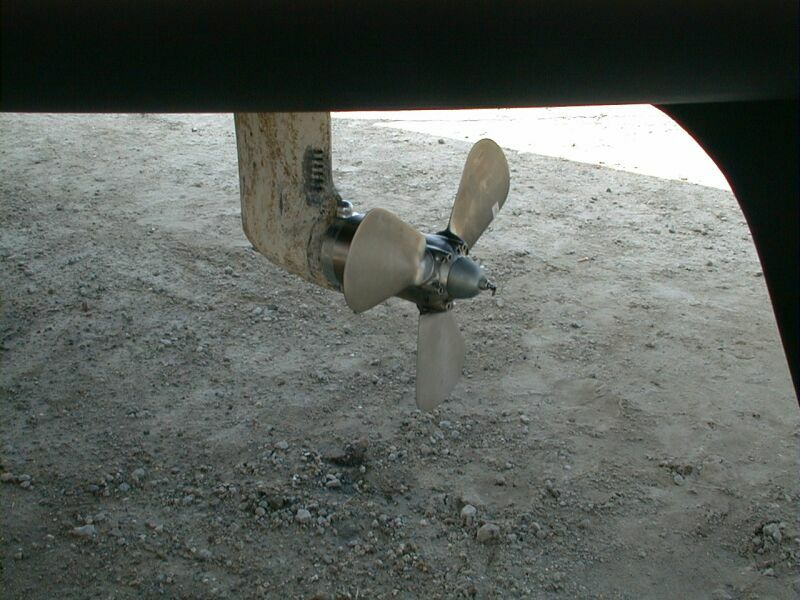 These propellors improve PatiCat's motoring in two major ways: they are three bladed so they cut the water smoother, and in reverse the blades completely swivel around so they have the same thrust in reverse as in forward. This greatly enhances reverse power. But, the real advantage is under sail - uh huh, the reason is the swivelling blades turn into a neutral no-drag position when the motors are off. This means the props don't turn or create drag under sail. This improves the performance under sail by over 10% - a big difference when you consider a trans-atlantic passage! Here are some pictures of these wonderful Australian made propellors after they were installed. They have an excellent design for adjusting pitch - you can actually dive under and use a simple wrench and allen wrench to adjust them. Better than any other feathering prop Frank could find. 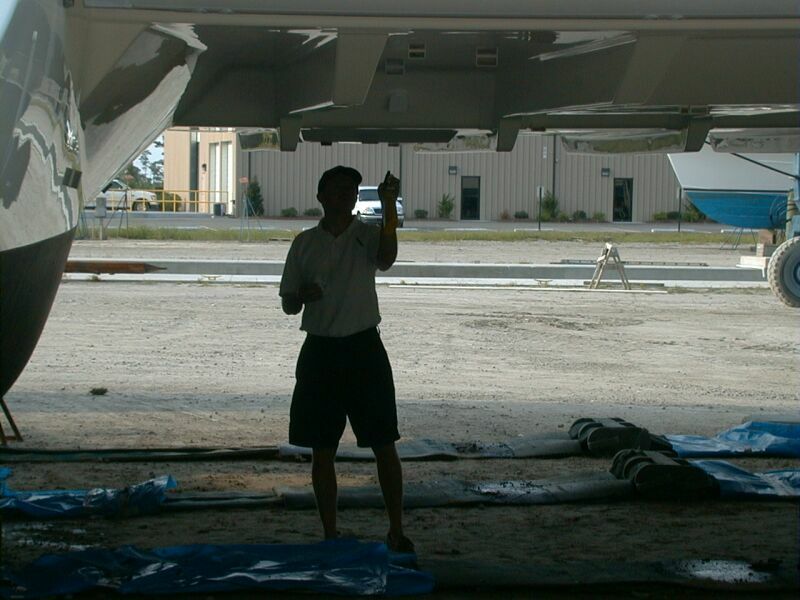 By far the biggest physical task for Frank turned out to be waxing the hulls. This was complicated by the paint trim paint put on by the bottom painting crew which covered the brown stains. 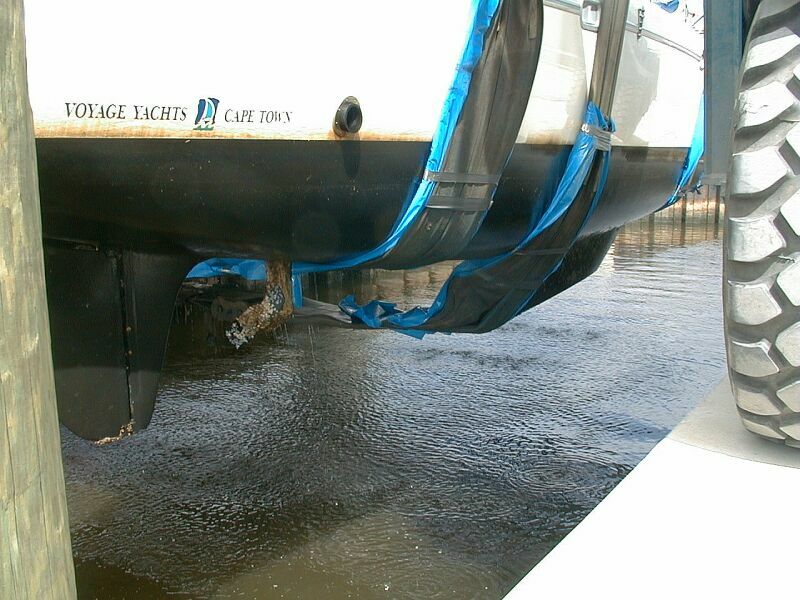 Due to time constraints, Frank had to clean and wax above the taped edges and then come back and clean and wax the edges of the hull AGAIN after they removed the tape! Whew! Even with a wax buffer this was a BIG job. It took about 20 hours of nearly non-stop work over two days. But, PatiCat was beautiful afterwards. 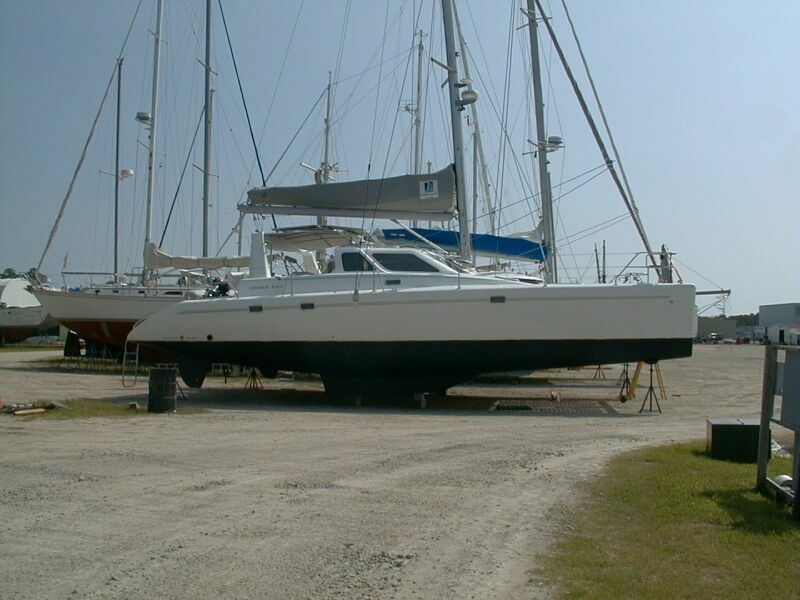 Here are pictures of her after painting and waxing, and putting PatiCat back in the water.